What an Alcubierre drive does to the fabric of spacetime. "Imagine that! It never occurred to me to think of space as the thing that was moving." Faster-Than-Light Travel has long been a staple of science fiction since it allows you to travel to other solar systems and back inside of a human lifetime. But in real life, of course, we run into the unfortunate fact that according to basic Einsteinian physics particles with mass can never reach the speed of light, never mind going over it. In 1994, however, Mexican theoretical physicist Miguel Alcubierre (pronounced "al-cu-BYAIR-ray") came up with a solution that is mathematically possible, albeit still out of reach of current technology. There's no law that space itself cannot exceed c, so instead of trying to accelerate the object past the speed of light, you move space itself around the object. The ship creates a bubble of spacetime of sorts, compressing space ahead of it and expanding behind it. Since the ship is not moving faster than light relative to the bubble, relativity is not violated. And there is no possible viewpoint from which you can see both the inside and outside the bubble, and find out it moves FTL; the inside of the bubble becomes undetectable to the rest of the universe when the light barrier is broken, and vice-versa: you cannot peek from inside the bubble. This makes the warp bubble behave very similarly to various fictional "hyperspace" drives: the ship vanishes and hurtles on hidden in a pocket subspace, completely straight... and completely uncontrollable. The interior of the bubble becomes causally disconnected from the rest of the Universe including the bubble itself. How to stop an Alcubierre bubble once it arrives at the destination is a complete enigma to modern science, but a sci-fi writer who wants to use the drive can posit a conjecture that the bubble bursts open when it hits a gravity well, since nothing forbids objects from outside from affecting the bubble. Therefore, the navigation is simple and very Star Wars-esque: point it straight to the target, engage warp jump and faff around until the ship arrives at the target star's gravity well, the bubble bursts and you return to normal space. If you miss, however... warping for ten years and arriving at the other end of the galaxy is the mildest possible consequence. The bubble can absorb interstellar hydrogen, which potentially can cause the bubble to become unstable if it absorbs too much when you warp for too long, and when it pops, all absorbed mass is released as energetic radiation according to E=mc squared. Even if you survive this blast, you are stranded in the middle of nowhere... and God help you if you collide with some small object while en route. The tricky part is, mathematically this requires a negative energy density, which in turn requires the generation of lots and lots of exotic matter with negative mass: a warp bubble (yes, Alcubierre used this term) large enough for a ship 200 meters across would require ten billion times the mass of the observable universe (though contracting the bubble's perimeter and expanding the volume inside it potentially reduces this to less than three solar masses). There's also various other interesting results, ranging from a possible Hyperspace Lanes implementation to the fact that when a ship decelerates from FTL, the energy release would fry anything ahead of it. There are several more proposed implementations of the Alcubierre drive that partly eliminate the original's fatal flaws. According to Cleaver and Obousy of Baylor University, the required mass is "merely" one Jupiter, not the whole universe. And if Harold "Sonny" White of NASA is right in his proposal of altering the warp bubble's shape, it's merely hundreds of kilograms,note This is amusingly following the Munchkin's First Law: "Any finite number can be reduced to zero." and the exhaust problem is kinda fixed, too. New research also shows by using toroidal positive energy density may eliminate the need for exotic mass. Fiction authors, of course, don't have to face the problem of actually building a practical Alcubierre drive, and since it was proposed it has become popular in harder sci-fi as a method of achieving Faster-Than-Light Travel without violating physics as they are currently understood. A form of Reactionless Drive and usually a subtrope of Faster-Than-Light Travel. Warren Ellis' Orbiter all but directly states that the shuttle has one of these. The name is not stated, but the description and picture of the warp field matches and Prof. Alcubierre's name is mentioned. Reed Richards develops a form of Casual Interstellar Travel that he calls "space folding" that resembles this by way of the ship appearing to spaghetti into a portal when activated. In Equestria: Across the Multiverse: The Stellarians, a group of alien species from the planet Stellaria that make peaceful First Contact with Equus due to their spike in tech level, use these for faster than light travel, which was largely possible due to one of their tribes being Gravity Masters. The Alkerbierre Drive from The Next Frontier is one of these, reverse-engineered from observations of the Deep-Space Kraken. It's not a particularly fast example, being capable of about one lightyear a month including downtime for course corrections. 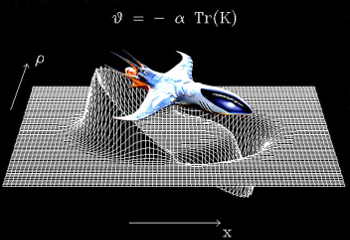 Though Star Wars technically use a "hyperdrive", its properties are surprisingly similar to the modern scientific findings about the Alcubierre drive. The navigation is "aim, shoot and pray", the ship can collide with objects in space while in "hyperspace" despite being invisible (with fatal results, yes, it ain't crop dusting, and it can even be weaponized as a ram attack, as demonstrated by Admiral Holdo), you can't see out, cannot change direction while en route and you only stop when you arrive. Galaxy Quest, nor surprinsingly as is an Affectionate Parody of Star Trek uses a drive system never told in detail but clearly based on Star Trek's warp drive. Used in both FTL and STL forms in the Star Carrier series. To go to FTL, most ships have to accelerate to near-c, whereupon they can use their relativistic mass to create an Alcubierre effect capable of traveling about a light-year and a half per day.note That's in human ships at the start of the series. Some aliens are faster, and by book four, set 20 years after the rest of the series, human speeds have increased to about 18 LY/day. At slower-than-light speeds the drive works the same way to accelerate capital ships to fast enough speeds to cross star systems in a reasonable amount of time. Fighters are small enough to use a singularity drive instead (generate a high-gravity field in the direction of travel and blink it on and off really fast to pull the ship), allowing much higher delta-v. In Ark, the Ark 1 is actually composed of two hulls connected with a tether, rotating around each other to generate gravity. Interestingly, due to how the ship's drive works, every jump is a Blind Jump: the destination is calculated beforehand, but once the ship enters warp, there's no way to drop out of it or even see what's happening at the destination prior to arriving. This is completely in agreement with the real life Alcubierre bubble science. In the Xeelee Sequence, the Xeelee discontinuity drive uses planes of distorted spacetime (similar to cosmic strings) to propel their craft to stupendous - but still sublight - speed. When the drive is active, hundred mile long wings of pure black stick out of the sides of the craft and their orientation is used to steer. Humanity eventually reverse-engineers the drive and uses it in their misguided war against the Xeelee's Big Dumb Object, sinking discontinuity drives into stars to fire them at the Great Attractor. Charles Stross' Eschaton series has the Alcubierre drive as one of about six methods of FTL travel or communication currently in use. It's mentioned to be extremely dangerous and difficult to use. Avengers of the Moon by Allen Steele is a reconstruction of 1930's pulp hero Captain Future. The Comet is no longer capable of Casual Interplanetary Travel (it needs to be ferried by a Solar Sail Mother Ship to travel to Mars), but there's a nod to the trope when Captain Future is rescued by a top secret Solar Guard patrol vessel that uses an Alcubierre field to generate a warp bubble. Star Trek's warp drive is a form of Alcubierre Drive, at least according to some of the technical manuals, and was the inspiration for Prof. Alcubierre's theory. The ship is surrounded by a series of fields that distort ("warp") space around the ship. However, because Star Trek predates the actual warp drive science, it has a lot of discrepancies with how an Alcubierre drive is supposed to work: they can see out of the bubble, maneuver in warp, exit it at will. Supplementary materials for The Orville state that its "quantum drive" is a variation on the Alcubierre theory. Role Master, Spacemaster Privateer campaign setting. The Quantum Drive uses quantum fields to warp space. The fields contract space in front of the ship and dilate space behind it, allowing the ship to effectively exceed the speed of light. The Tarka in Sword of the Stars use Alcubierre drives. They're the slowest but least restricted form of FTL in the game (humans and Zuul use Hyperspace Lanes, Hivers a Portal Network, and Liir and Morrigi speed is variable). The Shockpoint drive of Dead Space may be based on the Alcubierre drive. Star Control 3 has "warp bubble drive" as an alternative to conventional hyperdrive, which continues to work after hyperdrives cease functioning in our part of the galaxy. The technical details aren't elaborated, though. Considering when the game was made, it may have been a case of Ripped from the Headlines. According to the manual for Pandora: First Contact, all the ships (6 Sleeper Starships and 1 Generation Ship) sent to colonize the eponymous world were equipped with Alcubierre drives to allow them to accelerate to relativistic speeds. They were still STL, but much faster than a traditionally-propelled ship would be. Kett ships in Mass Effect: Andromeda are capable of using their element zero cores to create an Alcubierre effect. This enables long-range travel without needing the large mass relays that form a Portal Network in the original game trilogy, though it's less efficient. The Ring Engine of Drive compresses spacetime in front of the ship into a naked singularity to allow the vessel to go FTL. It has a nasty habit of smashing any planet caught in this singularity. Orion's Arm has these used on ships built by Archailects, though they can't exceed the speed of light and all but the most advanced put the ship outside the warp bubble, as it takes Sixth Singularity technology to dissolve a warp bubble without annihilating everything inside. FutureTimeline.net predicts that humans will have one by 1,000,000 A.D. In The Jenkinsverse the "Apparent Linear Velocity" drive is a version of this with the drawbacks removed. Most human civilians just call it warp drive. Steven Universe: Modern gem ships travel faster-than-light by using a gravity drive to warp space-time. This is shown by the ship creating a miniature black hole at a fixed point above itself for use as propulsion — it visibly spaghettifies as it vanishes into the sky.